Oh, how good it feels to be back! We've been raving on this blog about the return of our show, Never Mind the Mainstream, but here's an actual preview! Just look at that Photoshop masterpiece. I didn't learn much in computer class growing up, but Photoshop always held a special place in my brain. I knew it would come in handy someday, even if it doesn't further my education. Eat it, middle school computers after lunch period! So we're coming back on the airwaves, Friday 6-8 PM only on KUR. The links and additional information are all around you; it's not difficult to hear us. We're bringing the underground to your speakers. Your welcome. 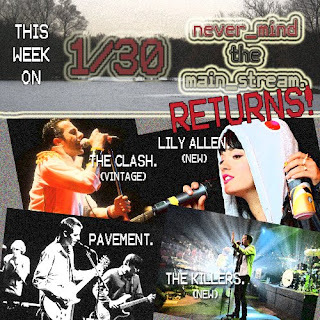 Here's what we got lined up for you on our first program of the new year: some fresh Lily Allen (I don't care what you think, she's a beauty), fresh Killers, vintage Clash, and semi-vintage Pavement (the 90's aren't classic yet). We also got a slue of oldies and newbies from the best alternative and indie rock artists in the game. Plus a killer mash-up and retro background beats - very funky. Guarenteed. And as always, call into the studio at (610)-683-4058; or IM us at KURRequest. We love to hear from our listeners, whether they're sober or drunk or full of life or a vegetable. You do not want to miss this epic return! Jim A. and MP are back! w00t!